Greece 1940: The antifascist struggles of yesterday. Turtle Island 2012: The necessity of struggle today. Greece 1940: The antifascist struggles of yesterday. 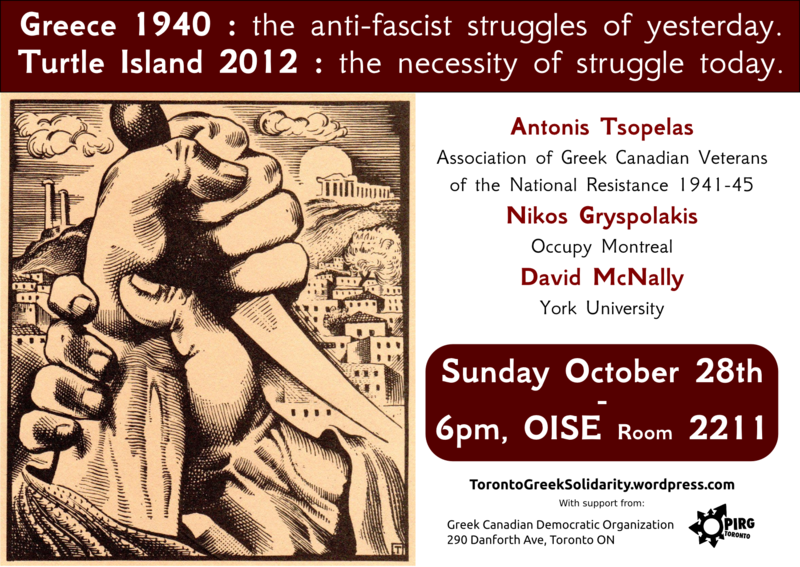 Turtle Island 2012: The necessity of struggle today. The capitalist crisis of 2008 brought class struggle to a new level of intensity. In Greece, the EU country most hit by the crisis, devastating policies are imposed to large sections of society. These expose the organic ties between neoliberalism and fascism, best seen in the meteoric rise of Golden Dawn. A true fascist party, Golden Dawn is involved in routine acts of violence and has recently started appearing in Greek diaspora. Learn about the actions of Greek fascists in Greece and North America. Relate, compare and contrast the history and the effects of the current capitalist crisis in Greece and North America.